The music of Gabriel Fauré, though admired by connoisseurs, has not got a real foothold among a wider audience. The reason is obvious: it is rarely self-assertive and spectacular, big gestures were foreign to him and even his Requiem, possibly his best known larger composition, is mild and unobtrusive – “a sweet lullaby of death” as Anthony Payne has described it. Piano music, chamber music and songs – or mélodies in French – was his true metier; his first ten opuses were mélodies and he continued to sandwich those three genres throughout his long and creative life. On the present disc all his music for cello and piano is collected and it covers a time span of 57 years, from the Dolly Berceuse, composed by a seventeen-year-old Fauré in 1864, to the second sonata from 1921. Among the lesser pieces the Berceuse Op. 16, probably from 1879, sticks out as an example of “salon music” – which it certainly isn’t, but Fauré got that label which annoyed him greatly. The Élégie Op. 24 from the following year was intended as the slow movement of a cello sonata. But he never got further than that and had it published separately three years later. It became a hit and it is superbly played here with well contrasted dynamics and highly dramatic. In spite of the attractive tune it is far from a salon piece. The publisher wanted however a sequel, this time a virtuoso piece, which wasn’t exactly Fauré’s cup of tea, but he wrote it rather reluctantly and was furious over the title the publisher gave it: Papillon (Butterfly). The publication was delayed fourteen years through the dispute this caused. It is virtuosic but it also has a middle section that is lyrical and melodious. The Dolly Berceuse is truly beautiful, and so is the Sérénade written in 1908 for Casals. Strangely enough there is no record of Casals ever playing it in public, in spite of his obvious admiration of it. The famous Sicilienne was intended for incidental music for Le bourgeois gentilhomme, but it was never used since the theatre went bankrupt! 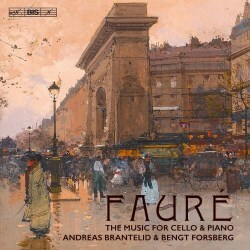 Instead Fauré reused it for the incidental music for Maeterlinck’s Pelléas et Mélisande in London 1898 and at the same time he made a version for cello and piano and it is certainly an attractive piece, gently rocking in 6/8 time. The most substantial works here, the two sonatas for cello and piano, are both late works. The first of them, written in 1917, is uncharacteristically aggressive in tone, especially the first movement. The war that was still ravaging Europe, may be one reason, but also the increasing deafness of the composer, who suffered seriously. The second movement, Andante, relaxed and beautiful, pours some oil on the troubled waters, but there are still dark undertones present. The finale, with canonic writing, has a more optimistic tone. The second sonata, written four years later, is quite different. By then Fauré was past 75, physically weak and practically deaf, but he seems to have reconciled himself with his situation, and his contrapuntal writing in the first movement is so assured and so vividly youthful. The Andante is an adaptation of a funeral song for wind band, which he had composed earlier that year for the centenary of Napoleon I’s death. It is indeed very touching. And the concluding Allegro vivo is vital and lively – one of the ‘great Fauréan scherzos’ as Jean-Michel Nectoux, an authority on the composer, has expressed it. The encore is the original version of the Romance Op. 69, which opened the disc, so this ties the end to the beginning. Andreas Brantelid’s Stradivarius from 1707 sings beguilingly in the many beautiful pieces and has power and intensity in the dramatic outbursts, primarily in the sonatas. Bengt Forsberg at the Steinway is as usual the firm rock in the seamless interplay. I am also deeply indebted to Jean-Pascal Vachon’s extensive and interesting liner notes. This is a disc to return to, over and over again, for the always attractive “salon pieces” but just as much for the great sonatas.